Loss of a loved one is a wound that hardly gets mended. 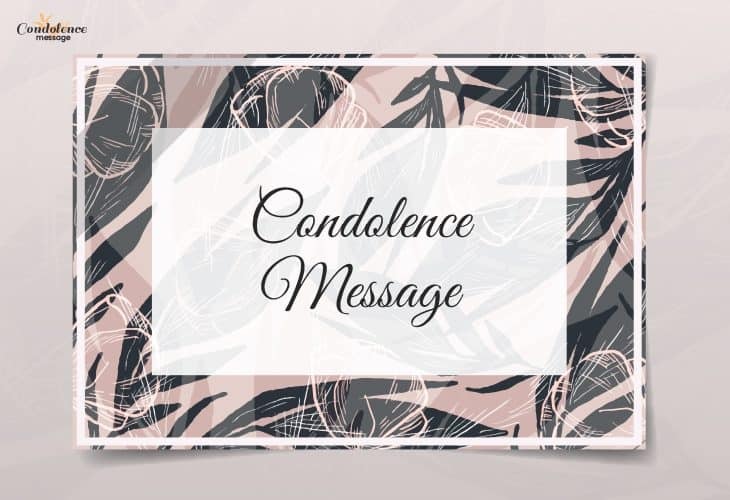 A gentle touch of condolence, however, can drive down the pain and that’s why the well-written condolence messages are exactly what you need for consoling the person who is suffering from a sudden demise of his/her loved one. When individuals go through a melancholy for an unexpected death or loss of their beloved, you, being a friend, should always be there by their side to let them know that you share their pain and distress. The messages of condolence may not take the entire pain out of their heart but it, surely, lessens the agony. The message of condolence is a sensitive group of words which not only acts as a message but carries a sheer empathy with it. The message should motivate the recipient and encourage him/her to go on with life. That’s the reason why crafting a sympathy message for a friend becomes immensely complex. But not anymore! We understand your true emotion for your beloved ones; so, we have come up with the heartfelt messages that will surely make your friend feel warmth once you send. You and your entire family have always been close to my heart. My deepest condolences for you for the loss you are bearing. It’s impossible for me to imagine the situation you are going through. But my heartfelt condolences are always with you. The loss you and your family bore cannot be consoled by mere words. But I want to pass my true condolence for you. My condolence for you and your family during the unexpected sadness you are bearing. My sincere empathy is always with you during this hard time you are going through. Believe in God, everything will be alright. May God give you the peace and strength that you need the most in this daunting circumstance. I am always there with you and your family. I know that my condolence cannot fill the void in your life. But my best wishes are always there for your well-being. May the darkest hours of your life end as soon as possible. My prayers, wishes, and thoughts are always there for you. More than sharing my condolence, I want to let you know that I am just a call away. You will find me by your side whenever you need in this misery. I am acutely distressed after the news of your loss. May God gives you the strength you need. My condolence is there for you. Please accept my condolence for the distress you are going through. Reach out to me whenever you need without any hesitation. May the warmth of care and love of the people around you keep you going in your life. My condolence to you in this melancholy. A ray of fortune will surely extrude these hours of darkness. Stay strong for yourself and your family. My empathy is always there. Memories of your loved ones are always there with you. So, don’t let your heart break down. They are watching you from heaven. Her wonderful behaviour and gentle nature can never be erased from our hearts. My heartiest condolences for you. He will never be forgotten. We will remember him and pray for him just how he did for us. Heartiest condolences for you. I wish all the peace, comfort, and harmony in your life in this devastation. My condolence is with you always. In this time of grief, I pray to the Lord for his blessing to you and your family. Please receive my earnest condolences. My heartiest condolences go out to your family. The void of such a kind person can never be refilled. I pray for his serenity. I cannot feel the distress you are feeling at the moment but I can assure you that God has given her a special place in heaven and she’s watching us. Deep condolences. May your uncle’s soul rest in peace and living the afterlife with full of serenity and delight. My heartfelt condolence is always for you and your family. Nothing can take you out from the pain of loss you are bearing right now. However, I’m always there for you and your family. My heartiest condolences to the grieving family, my heartfelt tears for the finest human being I knew. May God keep your family in peace and delight. In this sorrow and glee, I would request you to accept my true condolence. Lord will definitely comfort your family and you. Don’t shed tears because they are gone. Smile because they enlightened our lives with their presence. My deepest condolences for you. I know that you are going through an immensely painful situation. But I would just like to inform you that I am here for you for any needs. It’s always a tragic thing to lose a person you love but life has to go ahead and my heartfelt condolences are there with you. I am deeply pained to hear about your unexpected loss. It’s hard to bear but I am there for you whenever you need a shoulder. Shedding tears will not fulfill the loss in your life. But We can pray to God that they will come back into our lives again. Accept my condolence. I know your heart is empty for the loss and nobody can fill the void. But you should move on with the love of the others. I’m here for you. The loss of a near person is never easy. If there’s anything I’m capable of doing for you, don’t hesitate to let me know. Condolences from my side. A wonderful soul, full of faith and love has gone to heaven. We should be happy for him since he is close to the almighty God. Mere words cannot describe the feeling in my heart. My genuine condolences for you and your entire family. RIP. People may leave from the world but never truly leaves. They will always be alive in our hearts and memories. My condolences. May the Lord bestow his blessings upon you in the time of grief and misfortune. My heartfelt condolences are always with you. May the soul of the dearly departed rest in peace and serenity. Our deepest condolences for you and prayers for the beloved for the journey to the almighty. We may lose one of our most beloved persons but we have got one more angel who is watching over us from the heaven! Our sincere condolences for you and your family. Our deepest condolences for the person and the family who are suffering from an immeasurable loss of a divine human being. We know it’s hard to accept the unexpected calamity of the death of such a noble-hearted person but the soul is in God’s warm arms. Our empathies. With a heavy heart, we are sending our most sincere condolences to you. A demise of such a pure and kind soul is hard to accept but it’s the way nature works. Do call us whenever you need. The feelings I am going through right now cannot be written but know the fact that I will be there very shortly in this time of grief and utter blues. My Condolence. Words fall short to describe the love for such a generous person. He will always be cherished and remembered for his noble personality. My heartiest condolences for you. In the time of your suffering and pain, we are always there for you whenever you need someone to talk to. We may not fill the void but we are there by your side. We can only hope that our empathy, friendship, and honest condolence become the ointment in your wound. Stay strong. The news of your loss has deeply shaken me from the core of my heart. But that’s nowhere near to what you are feeling at the moment. My sincere condolences to you and your family. She will always be accepted by the good Lord with opened arms for the blissful acts and divine nature. My deepest condolences. Nothing could have been more painful than to hear her separation from life! May God rest her soul in peace. The warmest condolences from my side. His kind nature and the bright face will always be secure in our heart. Our most sincere condolence for the sudden calamity in your life. Wishing you all the peace and divinity for the upcoming days of your life. May God bless you and your family with all his blessings in this situation of blues. It’s still hard to believe the fact that she is not with us anymore. My heartiest condolences for you and your family in this great loss of yours. In this section, you will find the heartiest messages to console your friends, relatives, or colleagues in their orphaned situation. Explore the condolence messages on the death of mother, father, or grandparents written with utter respect and empathy. Choose the one you find suitable to your needs and send them to your friend in need. It was terrible to know about the sudden demise of your father. He was a great man. My condolences. I just heard the news of your mother’s sudden decease. Words cannot describe my pain as she was very close to me. My heartfelt condolences. My deepest condolences for the demise of your father. You need to stay strong and take care of your family. It was shattering to know that your mother is no more! My condolences for you and prayer for her life after death. Your father was a wonderful human being. It’s hard to believe that he is no more with us. My deepest condolence for you and your family. You may have lost your mother and we may have lost a kind, loving lady but the universe has got a bright, shining star in the sky. My condolence to you. Your mother may not be with you anymore but she is definitely watching you from heaven. Be strong for her and your family. My empathy is always with you. A generous heart has stopped beating and a kind soul has gone to the heaven. I send you my deepest condolences for the sudden demise of our beloved grandfather. It was a disaster for me to know about the loss you had to bear when your grandmother passed away. Your pain is unimaginable for me but my sympathy is always with you. A father is a firm shelter who always protects us from the calamities. But you need to have a strength and take care of your mother in this jest of destiny. I am there whenever you need support. The kindness and nobility that your father had could hardly be found in others. His demise has shattered me and everyone who knew him. My heartfelt condolences on the death of your father. He was not only your grandfather but was a warm sheltering tree for all of us. Our most sincere condolences for you on his demise. The pain of losing a father can never be felt by others. But I will do everything in my capability to keep you going. Accept my condolences. A candle, prayer, tears and condolence on the death of your grandmother. She was indeed a lovely lady with a golden heart. She will always be remembered. Your grandmother is under the peaceful protection of the Lord. Her absence will be felt with utter despair but let us pray for her life beyond death. The divine presence of your mother will always be missed. I cannot describe my grief in mere words. But my genuine condolence is always there for you. Your father has just left the earth but he is watching us all from the heaven. I know the depression can never be lessened but you need to accept it for your family’s sake. I am there with you always. Words will fall short to describe my grief on the death of your father but my sympathy and shoulder are always there for you. I would like to offer my deepest and the sincerest condolences to you and your family for the unfortunate loss of your grandfather. Your grandmother has been a true source of our smile and will be cherished till the time of our last breath. Our condolence to you. Your mother may not be with us physically but she will always remain in our hearts and mind. Her divine smile and kind nature can never be forgotten. Please accept my condolence on her demise. I just heard the news of your mother’s unexpected death. It’s shocking and shattering for me. I am reaching your home as soon as possible. Please accept my condolence. I pray to God to keep your father in serenity hereafter for the eternity. May my condolence bring you peace in this time of utter pain. Please accept my heartiest condolences on the sudden and unexpected demise of your grandmother. Do know the fact that I am there for any need of yours. Losing someone protective and loving like your grandfather is always heart aching. My true condolence for you and your family in this time of grief. Losing a spouse is never an easy situation to endeavor at any point in life. The departure of a life-partner can be one of the most intimidating phases of someone’s journey of life. In that situation, a gentle touch of condolence from a friend can be the breeze of relief for a person who has just lost his/her better half. Go through the following short and emotional condolence messages you may send to a friend or relative on the death of their husband or wife. I share the grief you are passing through on the death of your wife. She was a lovely lady with a generous heart. Your wife will be missed by all. I can’t show you the cut on my heart for her sudden demise. But my presence and condolences are always there for you. Your husband has always been an inspiration for me and all his colleagues. He will be missed by all for his generosity. My condolences. The kindness and compassion of your wife for everyone is hardly found in this world. God has a special place for her in his warm arms. My condolences in this difficult time of yours. My deepest and heartfelt empathy to you and your family in this grieving situation. May your wife find the peace and serenity in the life after death. My condolences for the loveliest lady and a great friend of mine. Your wife has a remarkable place in my heart and others’ life. She will be missed. It’s difficult for us to believe the fact that your husband has left us all, making us guideless! Our sincere condolences for the demise of your husband. My prayers are always there for your late husband. He has just gone to the Garden of Eden to watch us from there. Stay strong and accept my condolence. I will always wish and pray that the sweet memories of your wife give you the strength to go ahead in life. The pain is unbearable but she would have always wanted you to be happy. I can’t even understand how to console you at the moment! I can only say that your husband was a true friend and a great human being. Stay strong for your family. My condolences. Please accept my condolences on the death of your beloved husband in the grieving situation you are going through. The situation is not easy to accept but you need to be strong for your kids. I will pray to God that he grants the serenity and peace for your wife in heaven. Losing her is not an easy task for you but you need to stay strong. My condolences. Your wife was a dear friend of mine and my family. She will always remain in our hearts as one of the most generous individuals we knew. May got to rest her in peace. It’s hard to find a human being like your husband. He was a great support throughout my life. My heartiest condolences on his unexpected demise! I may not ever fathom the void in your life on the death of your husband. But I am here whenever you need a friend to share your distress. My condolences. I am blessed to know your wife for such a long time. She was a gift of God for me. I am deeply shaken on her demise. Please accept my condolence. I’m sharing my condolences with my open heart as a helping and kind woman like your wife is no more around us. My condolence is there for you. May God ease the pain you are going through at the moment. Our heartiest condolence on the gloomy day of your husband’s demise. RIP. One who leaves the earth, never actually gets erased from our lives. Your husband may be no more in person but he will always remain in our heart and memory. Always keep in mind that I’m always there as a good friend for you as your husband has passed away. He will be remembered and cherished by all. My true condolence. Your wife has just left the mother earth but is present in our lives as a shining star in the sky. Please accept my heartfelt condolence. Nothing could have been more painful than to hear about the sudden demise of your beautiful wife. Her nature was kind and loving. She will be remembered by me and my family. Rest in Peace. Your husband was the true definition of a gentleman who always helped the needy. He has been a friend, philosopher, and guide throughout my life. My deepest condolence on his sad departure. The death of your husband has made a hole in all of our heart. Our sincere condolence is always there for your husband. He is there in heaven watching us. I am deeply sorry for the loss you are bearing. I pray that your pain gets lessened with the tide of time. I’m always there with you. My sincere sympathy for the passing of your beloved wife. The loss of a brother or sister is the most painful thing in life and it is hard to fight with that situation. A relationship between sibling is the strongest relationship where you can have fun as well as share important things of life between each other. During the bereaving moment when your friend has lost his or her sibling, your generous messages of sympathy may be a moral gesture and support for the person. We are shocked and saddened to hear about the demise of your brother. We express our earnest condolences to you. Heartfelt condolences to your family on the unexpected death of your sister. I wish the soul of your little angel rest in peace and may God give you strength to cope up with this adverse situation. Losing your elder sister is such a pathetic event in your life. I know that she was like your mother. My prayers and sincere concern are always with you. Dear friend, I send you solemn condolences for the death of your brother. May Lord help you to endure power and strength. I request you to accept my utmost condolences to you for the death of your elder brother. Being the guardian of the family, he always guided you. May the Almighty help you to guide the family after him. I pray the light and power of God may fall on you and help you to get rid of these miserable moments after the demise of your elder sister. We are really shocked to hear the news of untimely death of your younger sister. We understand that the unexpected loss has brought extreme grief for your family. We pray for you and your family to cope up with a hard time. I know nothing can take apart the agony from your heart after the death of your little brother. I just want to say I am always there with you in every difficult period including this. It is hard for me to comprehend how painful this moment is for you. I apologize you for the demise of your brother. I pray for his solace in heaven and I promise you that I will always be a part in hard times. Your sister will be always remembered because of her noble deeds. We wish her tranquility in heaven and your patience in these toughest days. I cannot express how sad I am after hearing the departure of your brother. I know that he was your best friend and it is tough to feel up the empty space in your life after his death. I pray that may his love for you and family give you the power to lift up the sad days and unbearable situation in life. Your sister’s passing in this young age was truly unexpected and my heart is filled with sorrow and pain. Honest sympathies and condolence for your difficult time and tremendous loss. I cannot imagine that your sister is no more among us. Her early demise has pierced our hearts with a deep cut. I witnessed the two of you growing together and sharing everything in life. Have patience and endurance dear, I am there to hold your hand in this turbulent period. At this mournful moment, I can only offer my tears and extreme sympathy with grief. God only knows how I am feeling for the early demise of your brother. Please accept my love and condolences. I know that your younger sister was a gift in your life and her death has devastated your life. I cannot relieve your pain by my words but I will pray for you to the Heavenly Father. May the soul of your elder brother rest in peace. Heartily condolences to you and your family. RIP. I wish the time of incredible pain passes away soon and may God give you the power to overcome this situation. Extreme condolences for the death of your sister. I will miss her. May God’s grace heals your aching heart and the guardian angel of the Almighty guide you and your family to get away from the terrible period after the departure of your little brother. Courage and strength are the only blessings I want from our heavenly father from you after the departure of your brother. May God bless his soul. Amen! We hold temporary lives as we are the mortal beings. One day we have to get united with God. I only request you not to lament for this eternal truth and pray for the comfort of your sister’s soul. May this critical time of life pass soon and help us to bear the pain of the demise of our best friend’s younger brother. Utmost condolences. Our good Lord will show his mercy to your sad soul and help you to endeavor peace and power. Your sister was blessed to have a good family and sister like you. He will be guided by the angels in heaven. Seeing you in such as pain is really hurting. I regret the loss of your sister and pray for the tranquility of her soul. I promise to be with you always. I cannot even imagine how much you are suffering after the departure of your little brother. May the Almighty bless your family with his grace and heal the agony of your heart. Losing a wonderful sister is like a curse and bad dream. I offer my deepest sympathy and prayers for you and your family. Losing a child can be the most traumatic thing in the life of the parents. No words can relieve a father or a mother from the pathetic turbulence in life. Your polite behavior, affection and consoling speech towards the bereaved parents can sometimes act as a liniment to their burning heart. Express your feelings with these simple sympathetic messages on the death of a child. Although I cannot heal your pain with my words, I pray for your harmony and mental strength in this pathetic period. It is not easy to lose a child. I can understand, how thorns of the departure of your daughter are tearing your heart. Extending deepest sympathy, I wish peace and salvation for your sweet angel from the Almighty. Amen! If a child dies before his parents, I can understand how painful it is to bear. I have very fewer words to say but I wish his soul to rest in peace. RIP. I am deeply sorry for your loss. Your son will be always in my heart and I will pray for the comfort of his soul. They always walk beside us whom we love from our soul. Unheard and unseen, but your daughter will always be near to our heart. We will really miss her. A child is the pious gift of God. I am terribly shocked by the early departure of your loving daughter. You need to endure strength because you have to be with your other children husband during this time. We are deeply mournful by hearing the news of the decease of your son. May God provide you with the power to bear the pathetic loss. Death cannot be stopped and we are helpless to fight with it. I cannot heal your wounds but only can pray for the peace of your son. I will miss him always. Please accept my profound condolences and concern for the demise of your daughter. May her soul get nourished like a pure angel in the home of the Almighty. Amen! I understand there is no pain deeper than losing an offspring who is the part of your body. As a friend, I will stand by your side at this difficult time. With lots of love and heartily prayer for your kid who has departed. My words cannot act as a soothing balm to your deep cut of losing a son. Still, I want to assure you that I am always by your side. You can recall me anytime you want. Deep condolences. I only wish that may God play his magic and heal the pain of the heart of a mother who has lost her child. My honest love and sympathy for you. It is not easy for you to cope up this situation because giving birth to a child is painful and losing the child is a curse to the womb. May the Almighty give you power and endurance to bear the loss of maternity. I apologize you because I can only offer my support and warm affection during the awful situation when you have lost your elder child. May God heal the scars in your heart. Don’t worry! Your little daughter has lost a father but she is on the arms of our Heavenly Father. He will take care of her and keep her like an angel. Truly sorry for the terrible loss. Our heart starts trembling when we try to keep ourselves in your place. Hope you get away from the period of bereavement soon. The pain will get fade with the passing time but the happy memories of your little daughter will always be in our heart. We never expected that such a terrible incident will occur in your life. Really sorry to you. The untimely departure of your beautiful baby girl is really shocking and pathetic news for us. Honestly, it needs a strong heart to face this terrible phase. I am there with you during this unimaginably mournful phase and I wish everything gets well soon. Words may seem meaningless in this tragic period. Please remember my honest concern is with you. The little boy will be forever in our hearts and his memories are eternal for everyone. Please be strong and make sure that we are here for you and your family. My condolences to your daughter. Death is a bitter truth in our life by confronting it so earlier is unexpected. Noble condolences and prayer for the harmony of her soul from us. Words really fall short for a father who lost his son. I know it is hard to flow with the moment but your filial affection and God’s special bliss is always with the soul. He was the only heir of your family and destiny has done a furious deed by snatching him from your life. It is hard to fill the blank space in your life but I wish God will help you to do so with flowing time. This is the most harrowing time when we all need to pray for the departed soul of the child. May our Almighty supports us to bear the utmost power in our heart. Amen! The joy and love your little daughter brought to us is something we will miss forever. Rather than lamenting tears, try to cherish the beautiful memories of the little girl for the tranquility of her soul. The place of a teacher can hardly be filled in our lives since they act as our mentor, guide, parent, and friend at sometimes. Teachers also become the role model of our life and nobody can fill the place that our mentors acquire in our heart. The demise of a mentor, therefore, is one of the most distressful events. Your sympathy to a student who has just lost his beloved mentor can be a slight respite in the grieving situation. Thus, we have arrived with a few condolence messages for the loss of teachers. The teacher is the greatest gift of God who takes the second role after parents. I can understand that today you lost the main instructor of your life who taught you the way to lead life. Sorry to hear about your loss. Please accept my solemn condolence for the unexpected and tragic death of your cricket coach. We tribute white roses and tears with the deepest commiseration. It is never easy to say goodbye but we have to bid goodbye to our lovely music teacher. With deepest sympathy to our sir, we pray for the peace of his soul. The sudden demise of your loving tutor is shocking for us. We offer our tears and unfathomable condolences for the great loss of the school and the students. Extremely shocked to hear that our principal madam is no more. This news has broken the hearts of every student in the college. We pray for the solace of the pure soul in heaven. Amen! Our English teacher was the greatest source of courage and inspiration for every student. Deep inside our hearts, we will always keep her memory engrossed with respect and love. We will miss you. There are very few people in the world like your dance teacher. She has left a void that no one can fill up. Today, the entire school is mourning to the loss of an angel. May she rest in peace in the heavenly Garden of Eden. RIP. Nothing can break a heart more than losing a mentor in life. We know that your teacher was your idol and you wanted to be like her. I wish you fulfill her dreams by growing your career with new hopes. Her blessing is always with you. Heartily condolences. With our tears and heavy hearts, we bid goodbye to the soul of our teacher. He has taught the true meaning of our lives and gave us a lesson to achieve success. He will be always with us through his principles and teachings. I know it is impossible to replace the space of your teacher but life has to go on. So, rather than lamenting on her demise, pray for the comfort of her soul and her family. A few people are always remembered after death. Our professor will always be with us with his poems and the lessons he gave us in life. We pray for the salvation of his soul. Amen! I know it is hard for you all to say goodbye forever to the role model of your life. However, we all are mourning after this unexpected news. The day will be memorable with grief. Sincere condolences to your teacher. When God cannot come to earth, he sends a guardian angel to guide and take care. Our teacher was a lovely angel but the cruel destiny snatched her from us. I wish she could have stayed forever with us. Shedding tears and tribune of flowers to the graveyard of your history teacher will not be enough. Your success in achieving the utmost goal in career will be contentment to the soul of your teacher. The absence of our sports teacher will always be missed. He was our inspiration who not only gave theoretically but also the practical knowledge of life. May his noble soul be guided by the guardian angels in heaven. I cannot express my sorrow after the demise of your teacher. Words cannot define the agony of my heart. My earnest condolence for your sir. Body is an outer cover of a soul. The cover can be destroyed but the soul is eternal. So, do not lament because our ma’am will be always around us. Sorry to hear that your dance teacher has left all of us. The entire dance academy will miss the absence of the lovely lady for a long time. May utmost bliss be served to her in heaven. It is hard to believe that we will never get the classes from our lovely English teacher. It is mournful to believe that she is no more. But her sincere guidance and blessings will always be part of our life. Your sir taught you everything that you can remember and made you a successful and honest person. Now, he is no more but I wish his memory and lessons will cherish with the victory in your life. Words cannot express the pain and loss, it can only be felt. I don’t know how to reveal my sorrow but will pray for the quietude of the soul of your teacher. Earnest sympathy and condolences. The smile of our teacher was the gift of God. I wish to see that again in my life. It is time to pray for her. Honest love and remembrance to her. I know that your sir was a hero in your life. His demise has put a deep scar in your heart. Still, try to be strong and pray for the salvation of the generous soul. There is a life after death and I wish you get a blissful life after completing the journey of the mortal earth. You will always be missed with love and respect mam. It is not possible to forget a teacher so friendly like our philosophy sir. He was both our friend and philosopher. His departure is a great loss for everyone. We pray for peace and serenity for him. Losing a pet can be as sorrowful as losing an important member of a family. People have a strong and sensitive relationship with a pet and his or her demise is a great forfeiture in the life of the pet owner. Sympathy cards and condolence messages on the death of a pet can be consoling and honest support to the bereaved during that melancholy. Dogs are man’s best friend and the departure of your four-legged friend had voided a huge space in your life. I am earnestly sorry for your loss. Your pet cat was like your child. I understand you are shocked by her death. I will pray for the solace of her soul. Our canine friend has not really left us. He is in our memories with love and best wishes. Sincere condolences for your little puppy. Undoubtedly, it is not easy to lose a true friend. We know that your little bird was your best friend. We will truly miss her and I wish for the salvation of her soul. Truly I want you to cherish the cute memories of your little kitten rather than lamenting on her demise. Her absence cannot be filled but recalling her with a sweet note can give contentment to her soul. No doubt it is a cruel irony that your pet passed away recently. Please accept the grave condolences for your canine friend. The life of a pet is short and precious but in a succinct time, your Doberman became the best friend of your daughter. My heart goes out for the tragic death of your pet. May his soul rest in the Garden of Eden. Most people treat their pets like children, but I know you have treated your furry friend more than your son. No words can heal your pain but I wish times fades your pain away. I still remember the chirping sound of your bird in every morning. Today, she is not present between us but her voice is still in our ears. Her unexpected death has brought tears to our eyes. We will always miss your chirping friend. I am shocked to hear about the unexpected death of your fish because of water sewage. Please do not feel guilty because you and your family were not in the home. May her little soul rest in peace. RIP. I can still imagine your goldfish swimming in the aquarium. It is hard to believe that she is no more among her. I am sorry for the demise of your little friend. Your pup was more than a family member to. But the cruel destiny has made his life too short. I pray from God to give you forbearance power for the painful loss. Our prayers and thoughts are always with you in this tragic moment when you have lost your parrot. Her sweet voice will always be remembered. It is hard for me to express my grief by hearing the sad news of the death of your chick. Please don’t lament, her lovely soul is always with you. Rabbits are the cutest species on earth who are friendly to everyone. The demise of your lovely rabbit gave me a shock. I am earnestly sorry that she is no more. I can realize your agony, my dear. I solemnly pray to God for the salvation of the soul of your kitten. The school of fish used to swim in the green jar in the hall room. Seeing the multicolored fishes together was just amazing for me. I am heartily sorry for the death of a slimy friend among them. That day you found a little chick on the road and took her home. She was really cute and adorable. I can still remember the day and today she is no more. Grievous sorry for her demise. My eyes are filled with tears after hearing the death news of your kitty. She was one of my favorite friends. I pray for the solace of her soul. Sometimes, animals are found more sensitive than human beings. Their love and faith are hard to forget. I regret to say sorry of the demise of your lovely pet. Heartily condolences. Seeing him growing from a little puppy to a watchdog shows your strong connection with the pup. His unexpected death is really shocking. Honest condolences to our little friend. Your tiny cat was like a cute angel. Her brown eyes were sweet and appealing to everyone. We will miss her very badly and pray for the tranquility of the innocent soul. The little rabbit was the last birthday gift from your dad. She left us so soon that her absence is hard to believe. I am sorry that I can only offer my solemn condolences and tear for her. Your pet pup was not only smart but also the sensitive member in your family. His intellectual nature, honesty and friendly nature will always be missed. Earnest sympathy to his departure. The sudden death of your chirping friend has broken our hearts. I can really understand your pain. Please accept my condolences for the death of your bird. Sometimes, short notes with one or two lines of sympathy messages can be consoling for the family of the demised. Short messages can also be sent via sympathy cards to the bereaved. During the traumatic moment, some meaningful short notes can be soothing to the agony of the grieving person. May my sincere condolences bring contentment to the soul and ease the pain of your heart. Hearing about the demise of your dad is really shocking. My earnest sympathy to you. May the noble soul of your loving mother rest in the Garden of Eden with peace. Amen! Recalling fond memories and praying for the salvation of the soul are the only things I can do for the departed. The kind heart of your second God has stopped beating. I convey earnest condolence to your mom. I pray from the Heavenly Father to take care of the little soul of your loving brother. Amen! I extend my profound love and sympathies to you and your family during the dark phase of life. Truly sorry to hear the news of the early departure of your wife. May God bless her soul. Please accept our condolences for the unexpected demise of your uncle. I pray for the eternal rest of the soul. Wishing you and your family to be strong in this difficult period. Our teacher has gone from our sight but will be always in our heart. Please let me know if you need any help in this traumatic condition. A life partner is someone special who cannot be forgotten. May God give you forbearance power. Words may be short for expressing my sorrow for your tremendous loss. The memory of your aunt will become a treasure in our hearts. We will always miss her. When I try to put myself in your place, my heart shivers. It is hard to lose a husband at a young age. You and your family will always be surrounded by our love and care in this mournful time. Your grandfather was my role model and his departure has pierced my heart with thorns. I pray for the comfort of the soul. The sweet smile of your grandma will always be in my memory. I pray succor for the departed soul. You and your family will always be in our prayers. May God give you strength in this difficult period. The soul of your sister has ascended to heaven but we will always miss her presence. Our music teacher will always be in our memory through his music. We will miss his absence. Always remember that you are not alone. Our support is always with you. May the Almighty hold the soul of your daughter like an angel of heaven. Deep condolences. Please share your sorrow and agony with me in this dark period. I am always by your side. May the Heavenly Father support you with the power of endurance to overcome the gloomy period. Fondest remembrance to the noble soul of your grandmom. Serious condolences. May you get the power to bear the loss and help you to cherish the memory of your loving wife. Unfathomable condolences to the departed soul of your sweet little kitten. May the shower of God’s blessing make you more powerful and support your family in this pathetic time. It’s never an easy task to craft a message of condolence. Not only should the messages carry your emotion but should also be able to console a person who is going through immense pain and grief. Being a well-wisher, you need to put the right words that make the person feel better. The words should never be hurtful or harsh. Thus, a condolence message sent to a friend, relative or colleague is not only a carrier of emotion but a shoulder in support in form of texts.